Tuscany is famous for its natural hot springs and steaming thermal spa resorts, but how do you know where to go? Search no more. Here is how to choose a spa in Tuscany, and a rundown on some of the best Tuscan spas, natural pools and hot springs resorts. Renting a villa in Tuscany is so done (though still very fun). Today, the buzz is on Tuscan spas. With hot springs spouting out everywhere through the rolling countryside, the real fun is at the spa. But how do you know where to go? It’s not as if there is a lot of info in English out there. At least that’s what I found when I was searching for the lowdown on hot springs spas and resorts to enhance my trip to Italy. 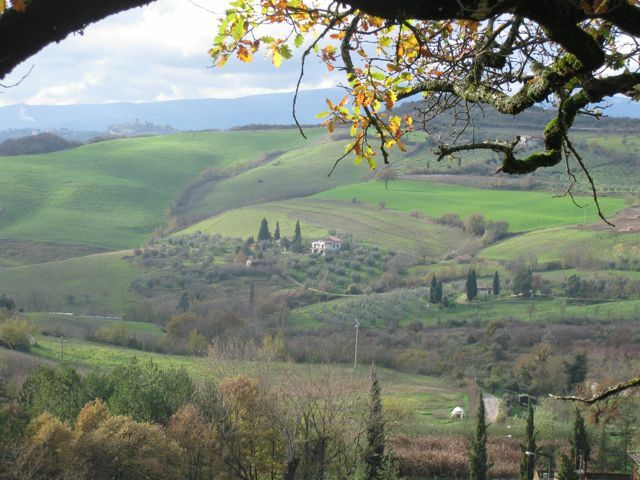 One way to choose a spa in Tuscany is to go there and explore the countryside for yourself. That’s what I did. And now I’m passing the info on to you. Tuscany is a place where glamour, healing and history converge. The spa tradition here goes back even before the Romans to the Etruscans, who built temples to their gods around thermal springs. 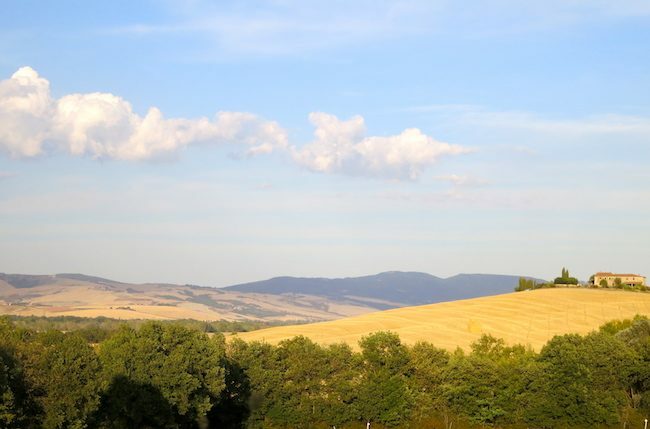 As a bonus, the hills of Tuscany are incredibly scenic with their cypress trees and soft colours, and you can choose from basic ‘splash-around-in-hot-springs-streams’ to 5-star resorts. Italy has some of the best spa towns in Europe. While there are so many wonderful thermal spas in Tuscany, the most famous Tuscan spa of all is probably the Terme di Saturnia. 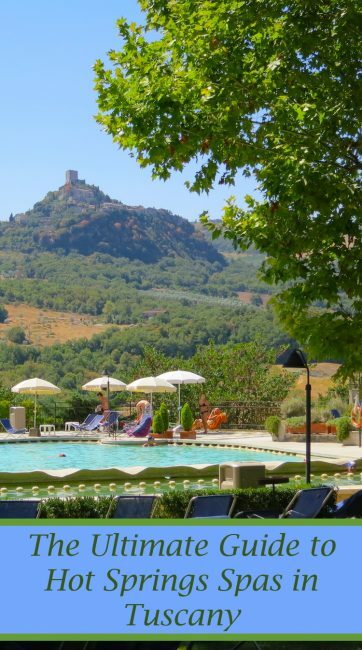 With both a 5-star luxury resort complete with outdoor pools and a full-service spa, as well as an open-air hot springs waterfall for nature lovers, the Cascate del Mulino, that cascades down the hill, there is something for both luxury travellers and DIY hot springs lovers on a budget of zero. The coolest (or hottest) thing about the pools at the resort is that you are soaking right over the volcanic crater from where the springs come out. Where is Saturnia? Located in the Maremma, a corner of southern Tuscany where few first-time-to-Italy tourists go, Saturnia is 180 km from Rome. Driving is by far the best option, but it’s possible to take a train to Orbetello and then a bus to Manciano and then another bus from there. 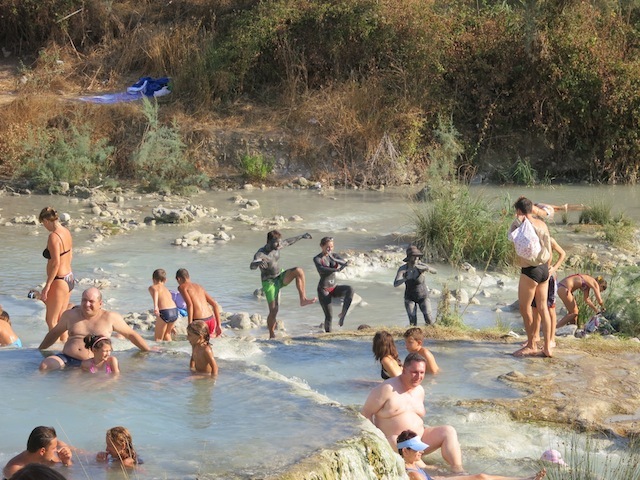 You might find it worth it: The steamy sulphurous springs at Terme di Saturnia were well loved by the Etruscans and Romans and are just as beloved today. To read more about it, go to my Saturnia spa blog post: visiting Terme di Saturnia. 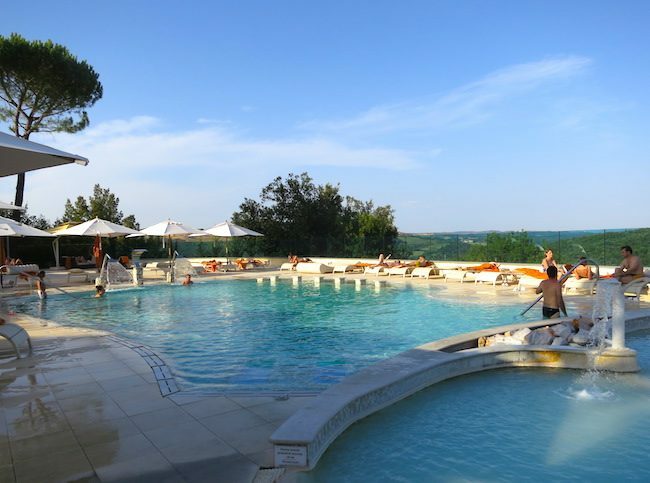 See prices at Terme di Saturnia. Owned by the same luxury spa company, the Italian Hospitality Collection, the spa resorts of Bagni di Pisa, Grotta Giusti and Fonteverde all offer high-end spa experiences with stunning architecture, fab Italian cuisine (unless you’re on the weight loss program, you might not be quite as excited), an interesting history and thermal pools fed by local hot springs. Each spa has a distinct personality, however, so to help you choose a spa in Tuscany that’s right for you, here’s a quick rundown on each. The monster I’m referring to is Frankenstein – because even hideous beasts like to get pampered. 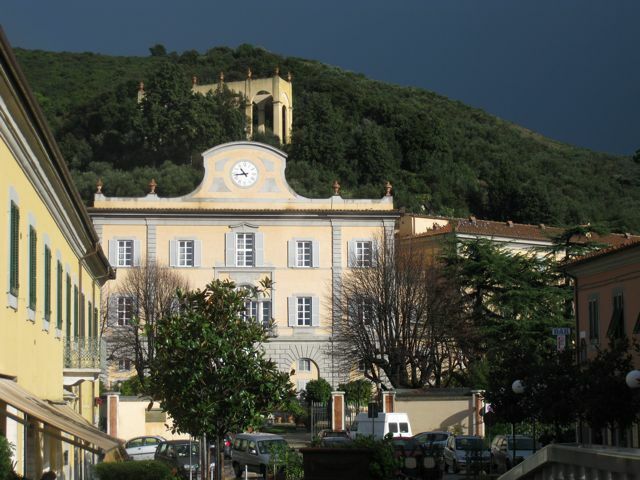 Oh, okay, it was actually Mary Shelley, the author of Frankenstein who visited the luxury Tuscan spa destination of Bagni di Pisa in San Giuliamo Terme along with other literary guests such as her husband, Percy Shelley, and Lord Byron. This was back when it was a luxurious private villa for the Duke of Tuscany. (And since Frankenstein existed in Mary Shelley’s head, he was technically here.) Today Bagni di Pisa is a luxury spa resort with indoor and outdoor thermal pools, lavish architecture and a setting in the Tuscan hills just a stone’s throw from Pisa. 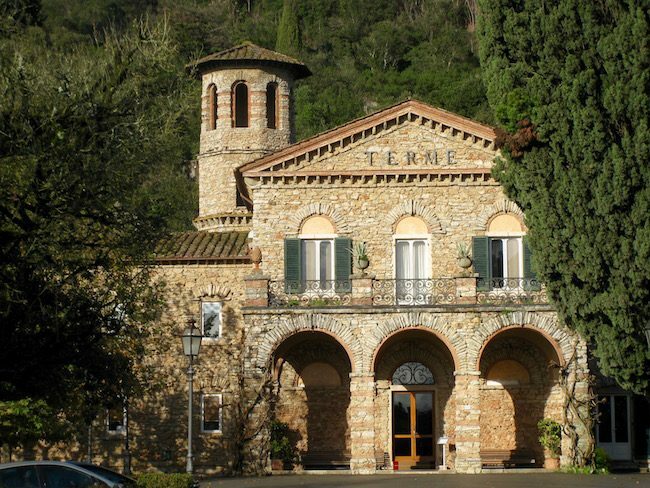 It’s the architecture and history that makes Bagni di Pisa Natural Spa Resort stand out. To this day, my suite (Room 215 in the ‘Noblemen’s Hall’), with its high ceilings and 18th-century ceiling fresco wins for my favourite hotel room of all time. And the Shelley Bar is sumptuous. Bagni di Pisa spa is also well known for its weight loss programs, and conveniently located near the Tuscan cities of Pisa and Lucca. You can practically see the Leaning Tower of Pisa from your room. It’s not a huge spa, however, and the pools are fairly small, but oh, those restored suites will make you salivate. Where is Bagni di Pisa spa resort? It’s located at Largo Shelley, 18. San Giuliano Terme 56017 Pisa Tel. : +39 050 8850. Getting to Bagni di Pisa: If you’re not driving, take a taxi or train from Pisa. At the Tuscan spa of Grotta Giusti (pronounced Chiusti) it’s all about the steamy cave grotto that offers natural detoxifying treatments in a 1,000 year-old otherworldly cave. The hotel portion of Grotta Giusti Natural Spa Resort is set in a restored 19th-century villa, and while Bagni di Pisa has a tiny little grotto, it’s nothing in comparison to this monstrous-sized therapeutic cavern. Where is Grotta Giusti Spa? It’s 40 km from Florence at Via Grottagiusti, 1411—51015—Monsummano Terme, Toscana Tel. : +39 0572 90771. Getting there: Take a taxi from Montecatini Terme train station, about four kilometres away. Check prices at Grotta Giusti. I can substantiate that the original Medici portico of the building still stands, and there are extensive water facilities. It was also a sacred site for the ancient Etruscans (ask at the desk to be let into the church that was formerly a pagan temple). Where is Fonteverde Spa? It’s located at Localita’ Terme 1—53040 San Casciano Dei Bagni, Tuscany Tel. : +39 0578 57241. Getting there: if you’re not driving the spa can arrange a private transfer from Chiusi Train Station — about 20 minutes away. Check prices at Fonteverde Hotel & Spa Resort. Located in the lovely Val d’Orcia, Bagno Vignoni is one of my favourite spas in Tuscany, mainly because of its casual low-key charm. Once a pilgrimage stop on the Canterbury to Rome route, the town of Bagno Vignoni has an eye-catching pool in the main square where pilgrims once bathed their feet, but which is not in use today. To spa and relax at the hot springs you have a couple of options. We loved the outdoor pools, the Piscina Val di Sole, at the 3-star Hotel Posta Marcucci (closed from Jan to April), even though it’s more laid back than luxurious. You can get a day pass, and many people do, but we stayed the night at the hotel so we had free pool access. Another way to spa in Bagno Vignoni is to go luxe at the upscale Adler Thermae Spa and Resort. 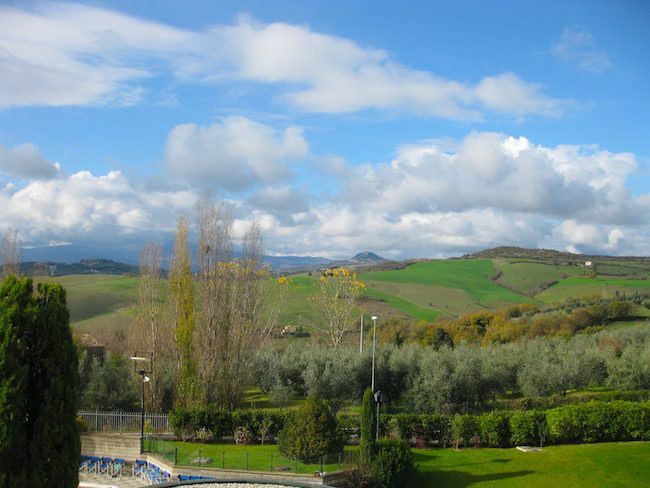 This 5-star Tuscan spa resort is popular with North American visitors. Located just outside town, it looks divine. I’ve wandered in, but never stayed, though I’ve heard excellent things about it. Where is Bagno Vignoni? Bagno Vignoni is about 133 km from Florence in the province of Siena. Getting to Bagno Vignoni: Like most spas in Tuscany, driving is the easiest way to get there. By public transportation you can take a train to Buonconvento Station which is 22 km away. There is bus service from there. 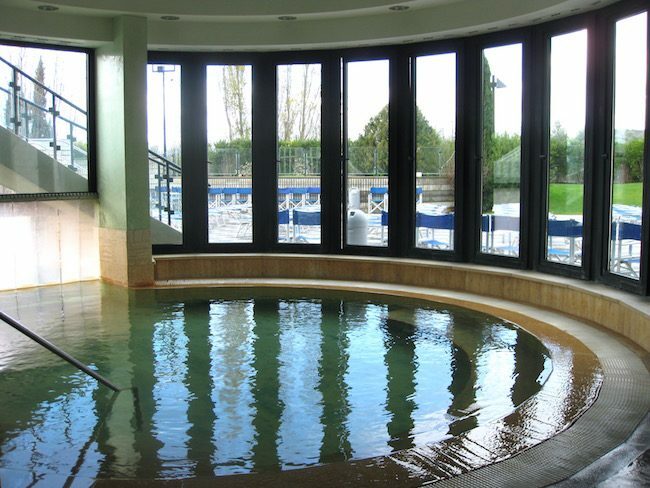 Check prices at Adler Thermae Spa and Relax Resort. 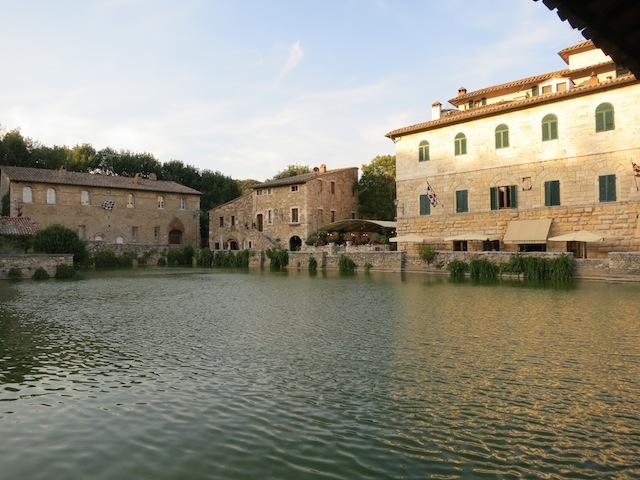 Town centre of Bagno Vignoni – this was the pilgrim’s place to relax and soothe sore feet. It’s only a 30-minute drive to Bagni San Filippo from Bagno Vignoni, but my husband and I didn’t have much luck with with our spa trip there. 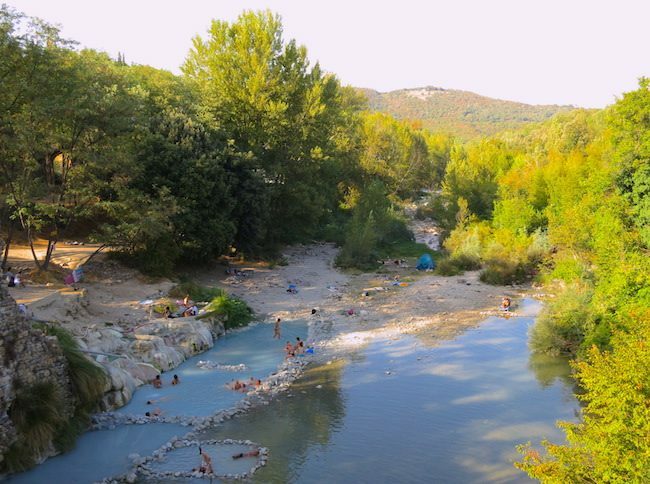 The thermal springs of Bagni San Filippo are situated between the Val d’Orcia and Mount Amiata, about a 15-minute drive from San Quirico d’Orcia and Pienza. Our problem was that we arrived late in the afternoon hoping to stay the night, but couldn’t find a place with available rooms. Still, we enjoyed the outdoor public thermal pool, which is rather basic but large. We then tried to find the wild natural springs and waterfalls in the woods I’ve heard so much about, especially the calcium-encrusted waterfall called the ‘white whale.’ Instead, we ended up tramping around through the forest for an hour before giving up and driving to Bagno di Vignoni, which, since we ended up liking it so much, was all good. Would I give Bagni San Filippo another try? Absolutely, but we’d either arrive earlier or book a room ahead. 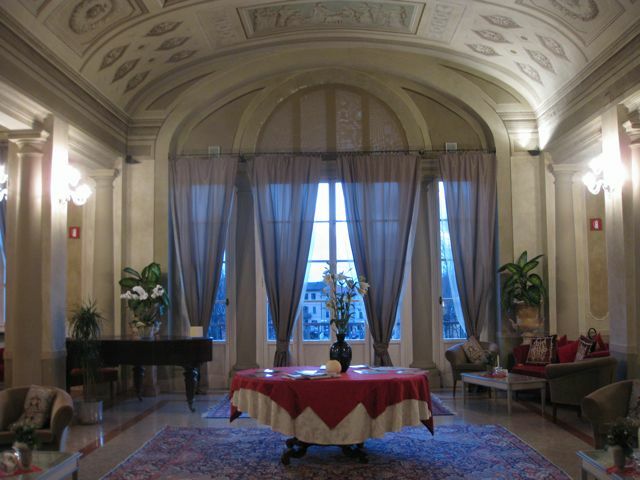 The hotel connected to the hot springs is Hotel Terme San Filippo & Spa. Check prices. We still talk about our room (my husband and I, not the waiter and I), which was flooded with light, had an ornate chandelier, hints of gilt and a glam red marble bathroom. Petriolo Spa Resort sits just off the highway. This could be off-putting except once you’re in the hotel you don’t notice it, at least we didn’t. We were too busy facing the other way enjoying the view of the Tuscan scenery; lounging in the to-die-for outdoor pools, so full of calcium powder that you can scoop it up by the handful; and wandering down the hillside through the forest to the natural springs on the banks of the Farma River. The free natural springs are a bit New-Age-y where, in addition to Italian hippies, you can also see the ruins of ancient Roman baths. 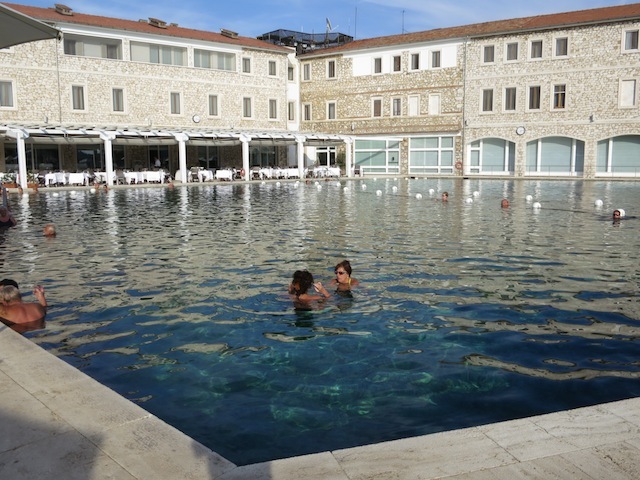 There is also a public spa, the Terme di Petriolo, which has cheaper spa treatments than the deluxe Petriolo Spa Resort where we stayed, but the pool isn’t huge and it’s not nearly as luxe. Where is Terme di Petriolo? Petriolo thermal springs are near the town of Monticiano, 30-minutes south of Siena on the road between Siena and Grosseto. So there you have it, some divine thermal spas in Tuscany, from natural pools to 5-star spa resorts. 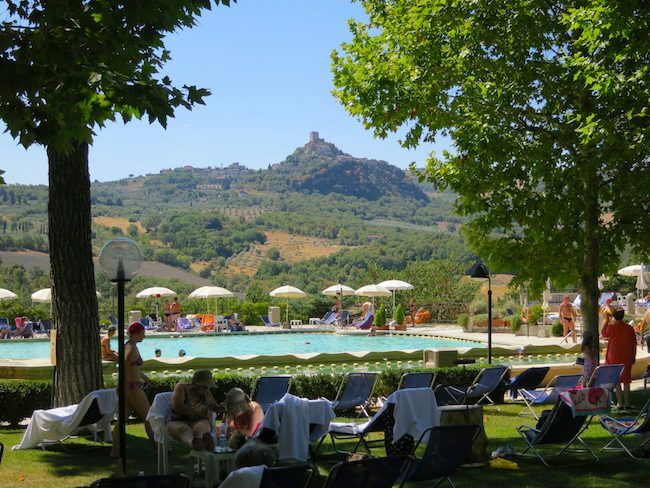 If you’ve been wondering how to choose a spa in Tuscany that’s right for you, hopefully this travel blog post will help, because to spa in the hot springs of Tuscany is to connect with the countryside in the most liquid dreamy way. Disclosure: This spa post contains some affiliate links to Booking.com. If you book through me, I get a small (like really small) percentage. If I’m lucky, one day I’ll earn enough for a whole night at one of these hotels! But rest assured, this is at no cost to you. Thanks. Great pictures! Would love to follow in the footsteps of Mary Shelley!